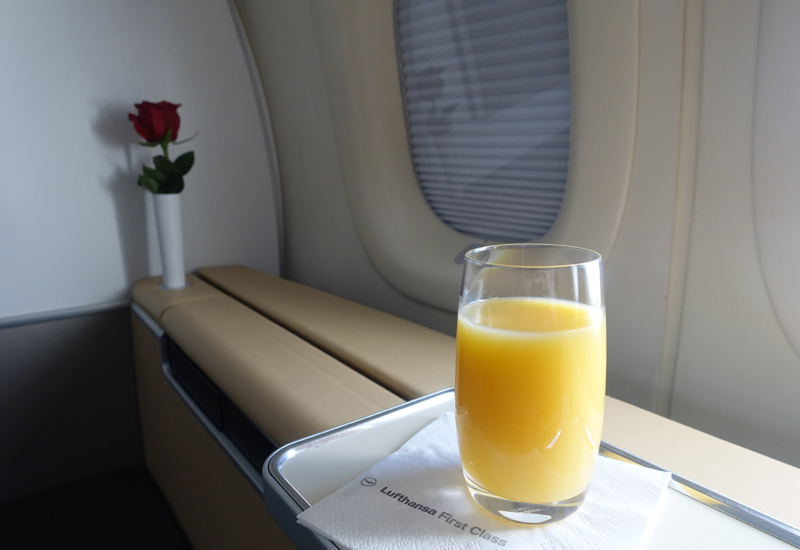 This Lufthansa First Class Review in a 747-8 from NYC JFK to Frankfurt is part of a new trip report including luxury hotels and dining in Paris and London. 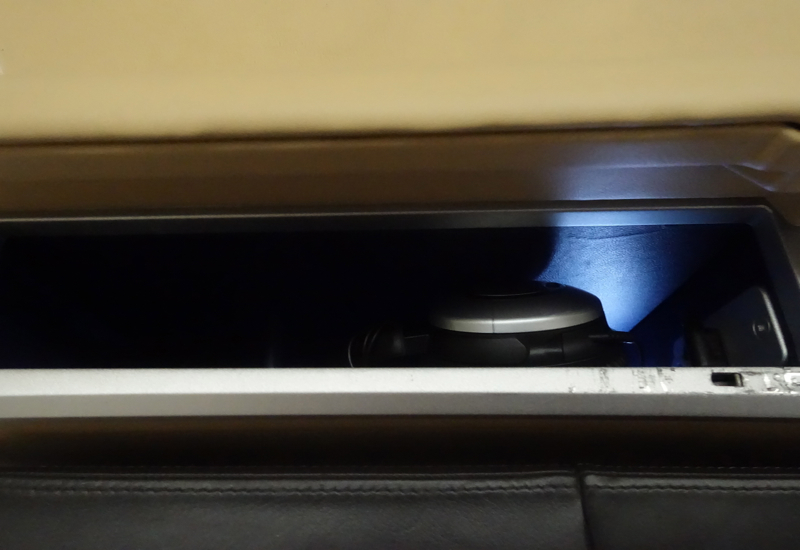 For the first post, please see Review: Lufthansa First Class Lounge JFK Airport Terminal 1. 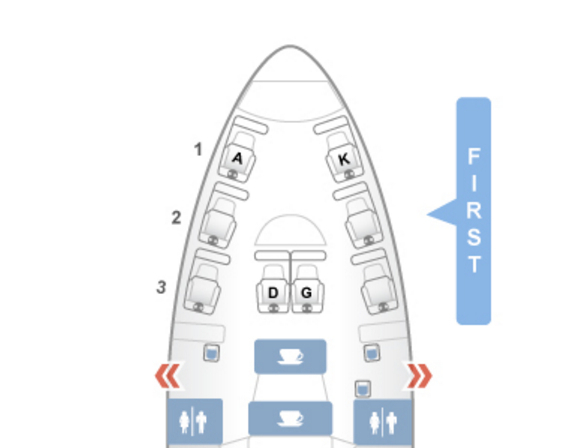 The Lufthansa 747-8 First Class cabin has 8 first class seats, 3 window seats on each side and two couple’s seats in the 3rd row, 3D and 3G. 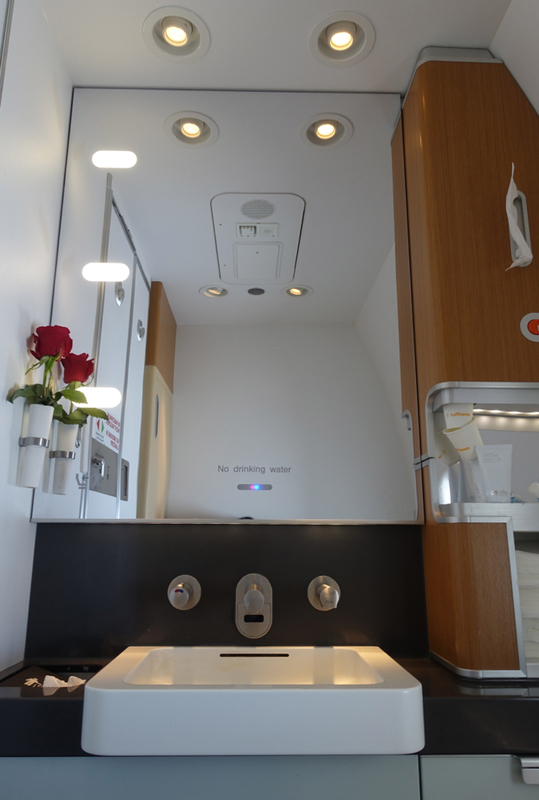 But unless you need to be right next to each other, my recommendation even for couples would be seats 1A and 1K, so you can each have a window seat, and also have greater privacy since you’re in the very front of the cabin and no one will be walking past your seat. The First Class cabin has a spacious feel, since there are no overhead bins. 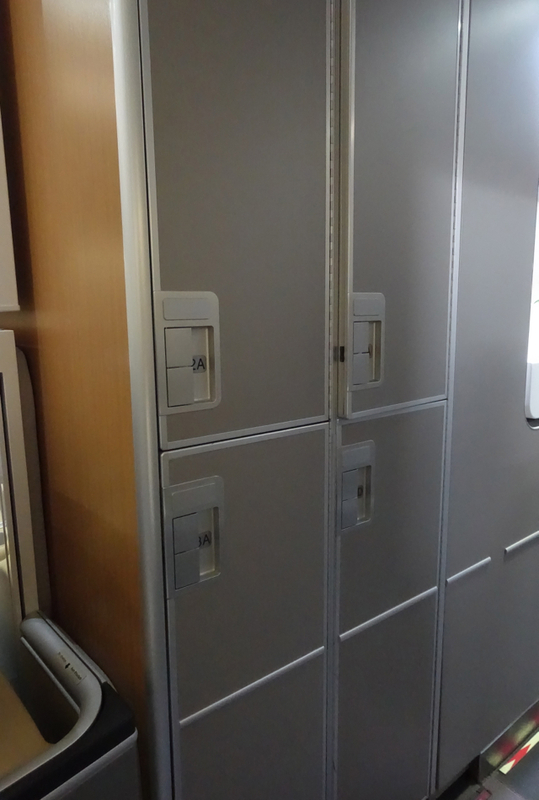 Instead, each seat has its own locker assigned to it for hand baggage, and these also come with hangers, in case you need to hang a coat. Lufthansa’s first class seat is nicely padded and quite comfortable and generous width-wise at 31.5 inches. 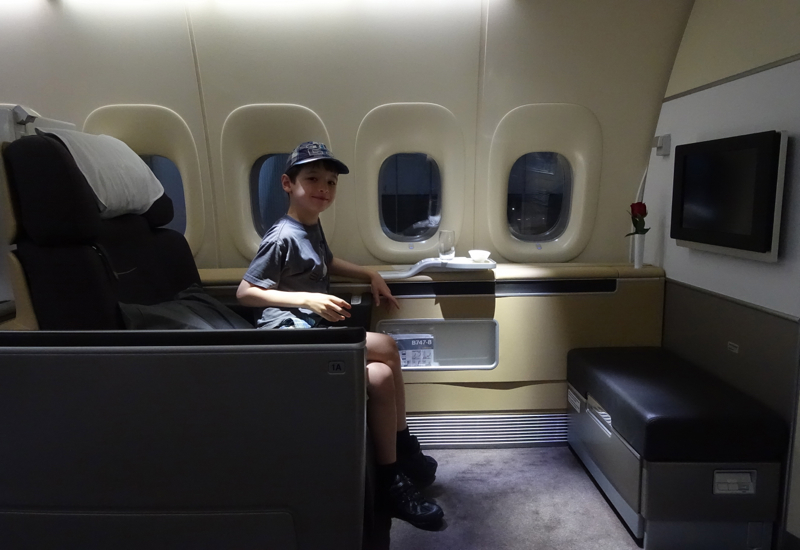 It wasn’t possible to sit next to my son to read to him however, as it is in Cathay Pacific First Class, which is the widest in the sky at 36 inches. 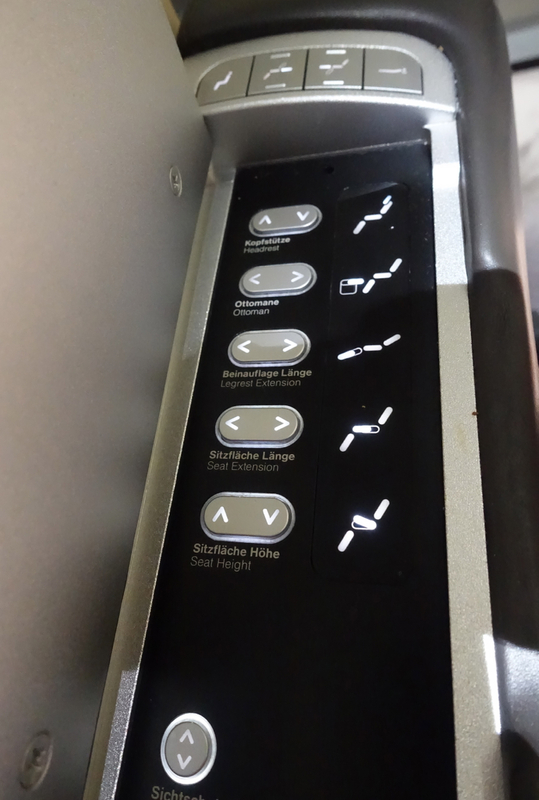 The seat controls have several individual controls, but most passengers will probably find the set seat positions sufficient. 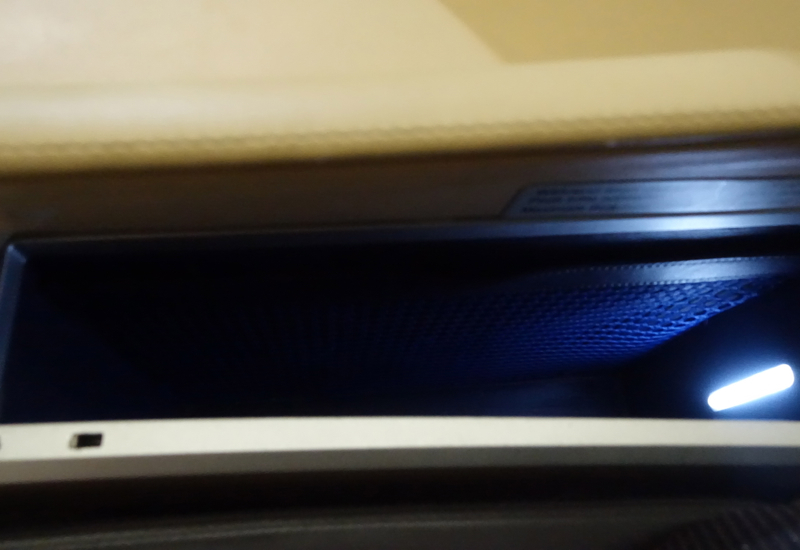 There is also storage space under the ottoman, underneath the IFE screen, but don’t forget to check it before you leave—I inadvertently forgot my sun hat in it. 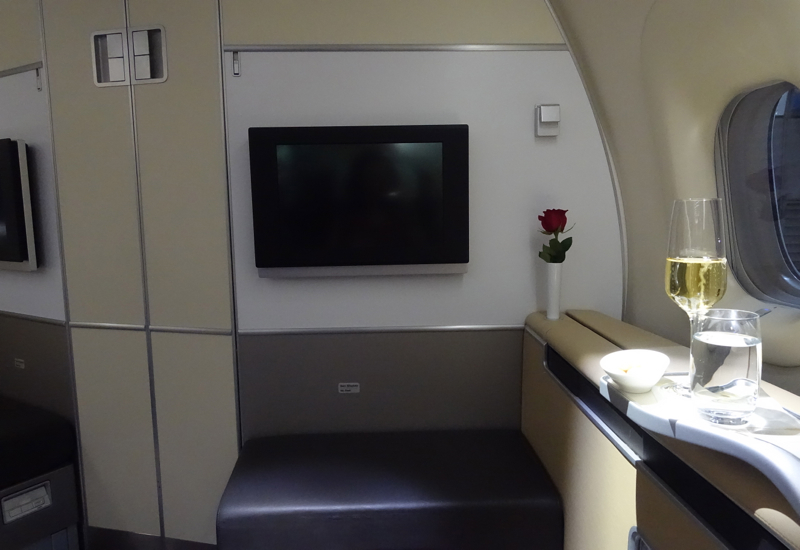 One of the things I love most about Lufthansa First Class is that there's a red rose in a vase by each passenger's seat–so elegant. 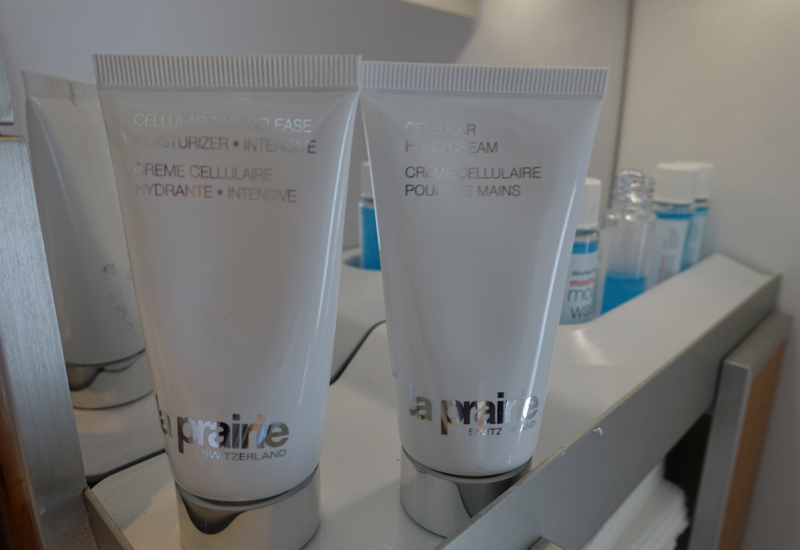 There's also a red rose in the First Class bathroom, along with La Prairie hand wash and moisturizer. The bathroom also has a window. The pajama top was of soft grey cotton, and good enough to keep as part of my rotating airline pajama collection. 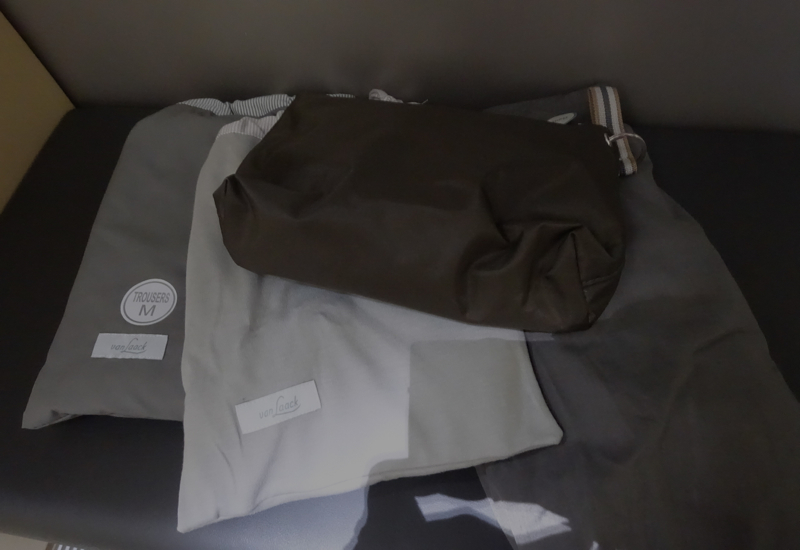 It could double as a casual top, although as with most airline pajama tops isn’t stylish, the way the Etihad First Class women’s pajama top is. 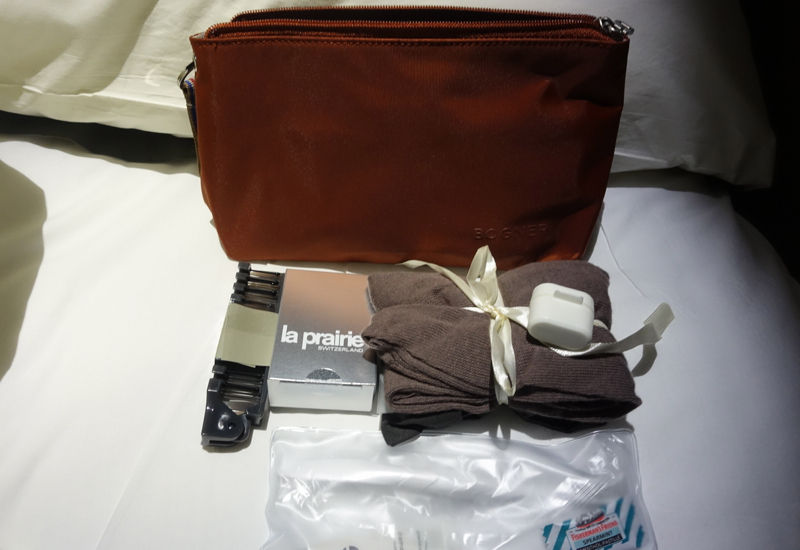 The Lufthansa amenity kit is one of the more underwhelming first class amenity kits, but it does include the basics—compression socks, toothbrush kit, comb, ear plugs, sleep mask and a small box of La Prairie skincare products. My favorite thing in it is the sleep mask, as the adjustable Velcro strap is longer compared with most other airline sleep masks, and more comfortable to wear. Prior to take-off, we were offered a pre-flight drink. 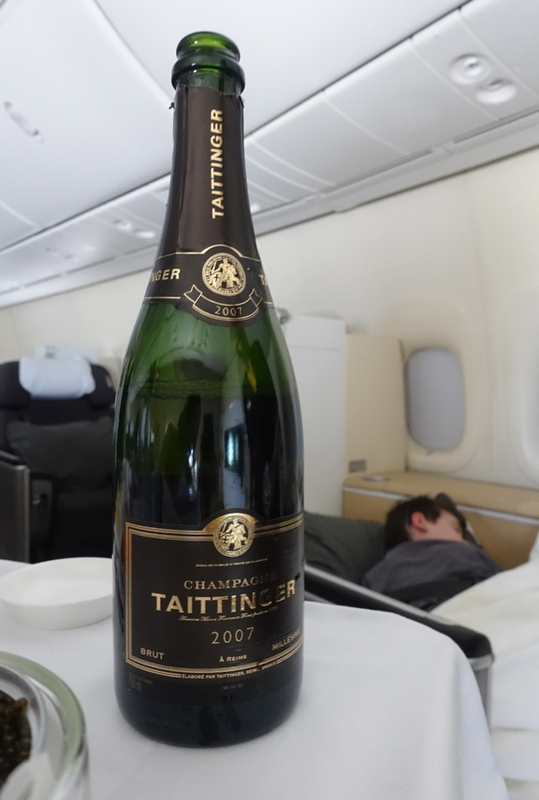 I was going to have my usual water, but the friendly attendant serving the first class cabin convinced me to indulge in a little champagne. 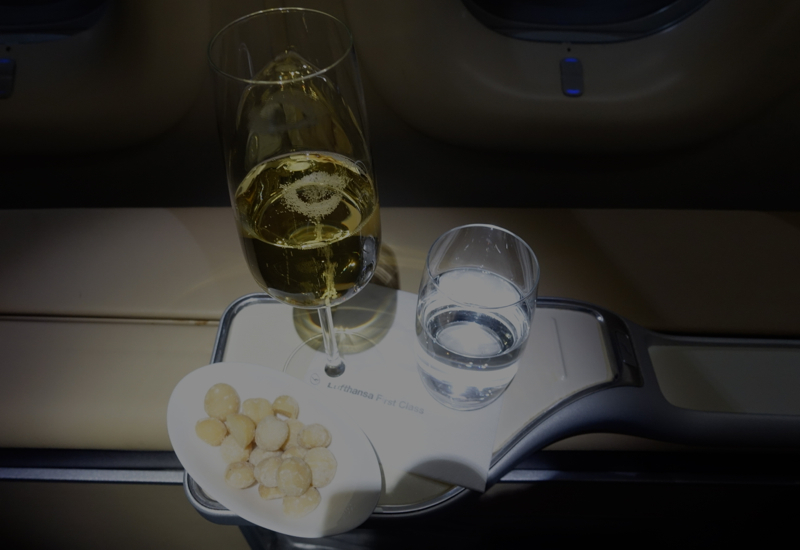 It came with Macadamia nuts, a luxurious choice as nuts go, and my son ate nearly all of his, claiming to still be hungry even after his rather substantial dinner in the First Class Lounge. 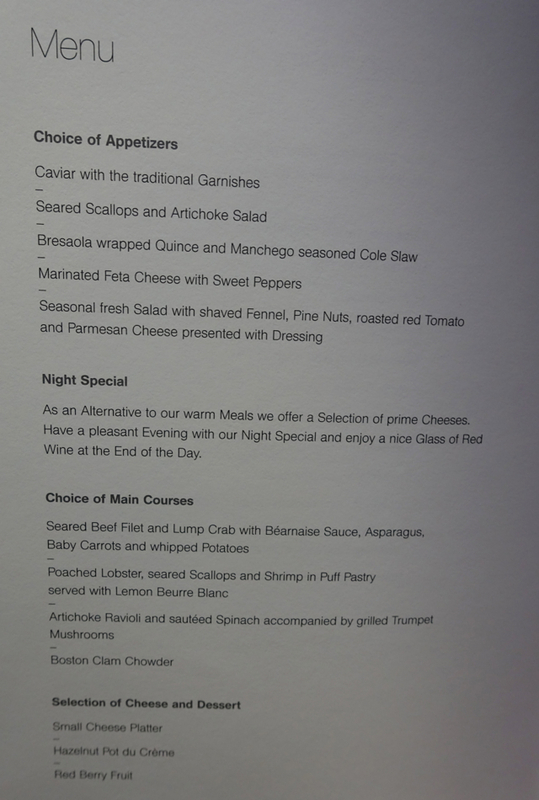 We were also given menus before takeoff, and the lobster/scallop entrée certainly sounded tempting. Since what I wanted to do more than anything was to get some sleep, I asked the attendant if some caviar could be saved for me for breakfast. She was happy to oblige, and since there were no other first class passengers on the flight, I didn’t have to worry about depriving anyone. A glass of orange juice was also offered. 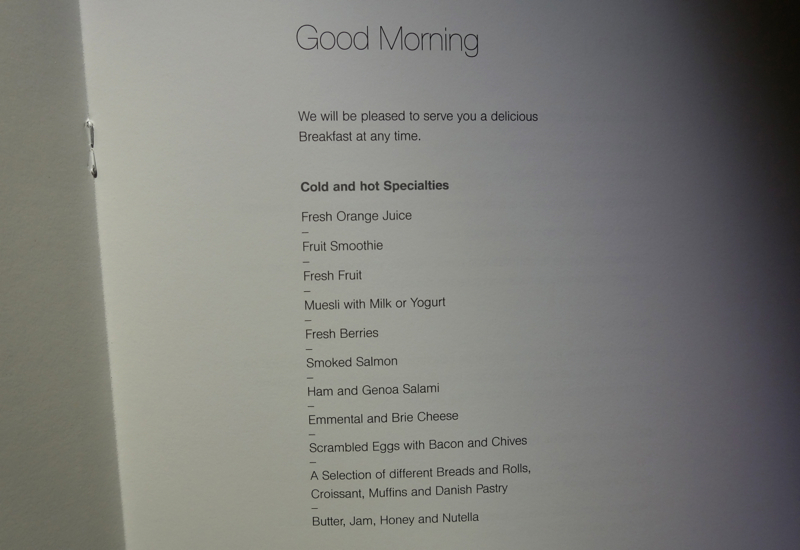 As you can see from the earlier breakfast trolley photo, the orange juice was from concentrate and not fresh squeezed, so in other words, not as good as Air New Zealand Premium Economy (my new standard for airlines' premium cabin orange juice). 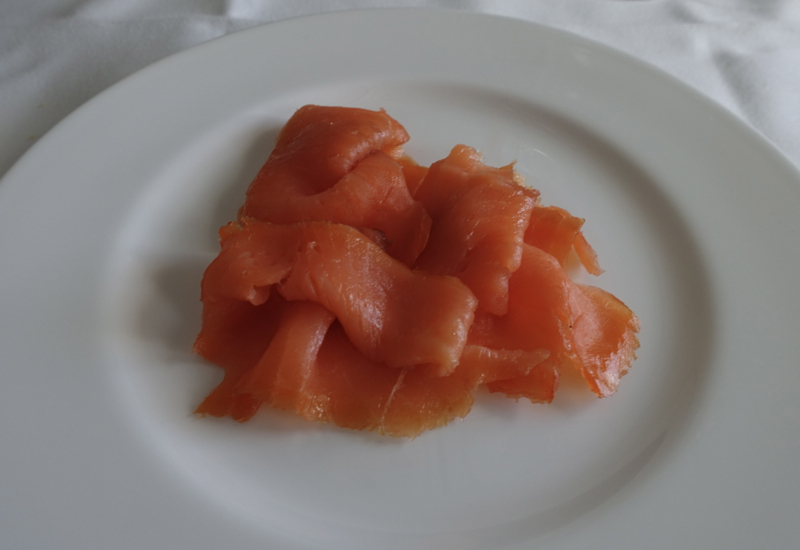 I also opted for some smoked salmon, which I prefer over breakfast meats or even over scrambled eggs, which were also offered. 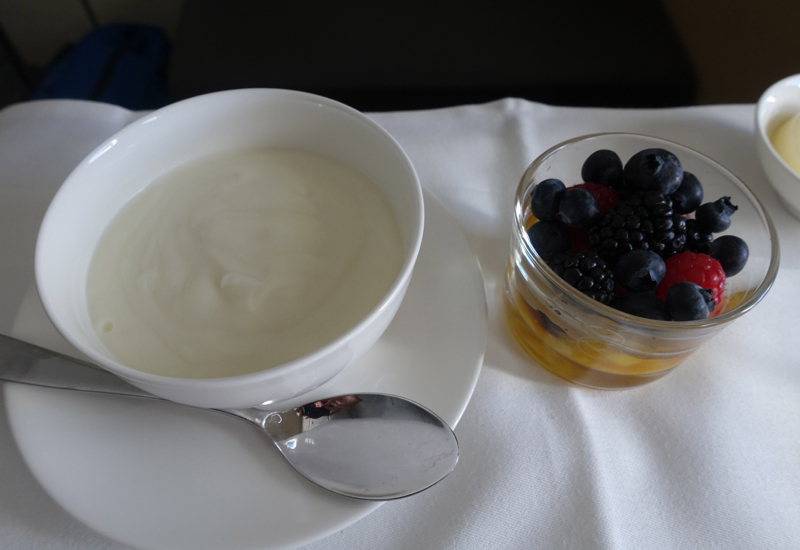 Next was some plain yogurt, which I enjoyed with some berries and passion fruit sauce, as well as some muesli that I mixed in. I asked for a cappuccino, and the flight attendant was very apologetic, noting that normally it would be available but unfortunately the machine on this particular aircraft was defective. I opted instead for English breakfast tea with milk, which to be honest wasn't very good, but everything else was excellent, so I really had no complaints, other than the fact that I think there should be some effort made to get fresh squeezed orange juice catered (not orange juice that's actually squeezed on the airplane of course, but chilled fresh squeezed juice similar to what you can get from any Whole Foods grocery store in NYC). 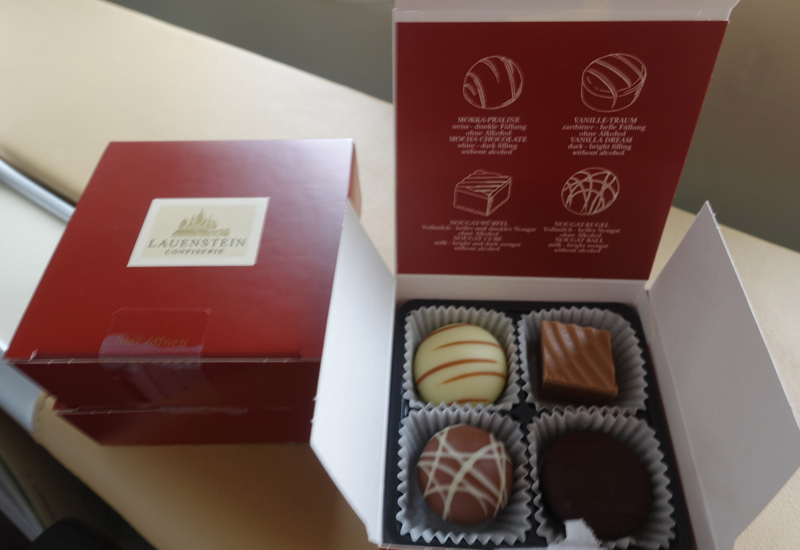 As a parting gift, we were given these Lauenstein chocolates. A very nice gesture, although I have to say that Qantas First Class has better taste when it comes to chocolate: Amedei chocolates from Italy. We had a protracted wait on the runway out of JFK and a rather bumpy ascent to our cruising altitude, so it was quite awhile until the seatbelt signs were turned off. Given the late hour–it was nearly 3 hours past my son's usual bedtime–he was already sleeping curled up in his chair by the time I was able to recline his seat fully, and I didn't want to wake him up by moving him while his bed was made up, so the crew kindly tucked the duvet around him to make him cozy but I didn't have them attempt to put the mattress pad under him. 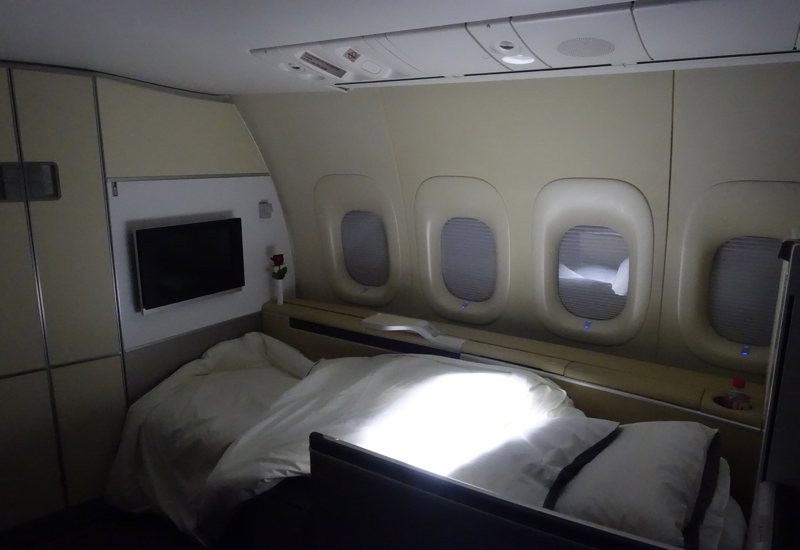 I did ask for turndown service for my bed, however, and together with a sleep aid I managed to get several hours of good sleep, which is rare for me apart from Singapore Suites and JAL First Class or JAL Business Class flights. I definitely found the bed more comfortable than in Emirates First Class or Etihad First Apartment. 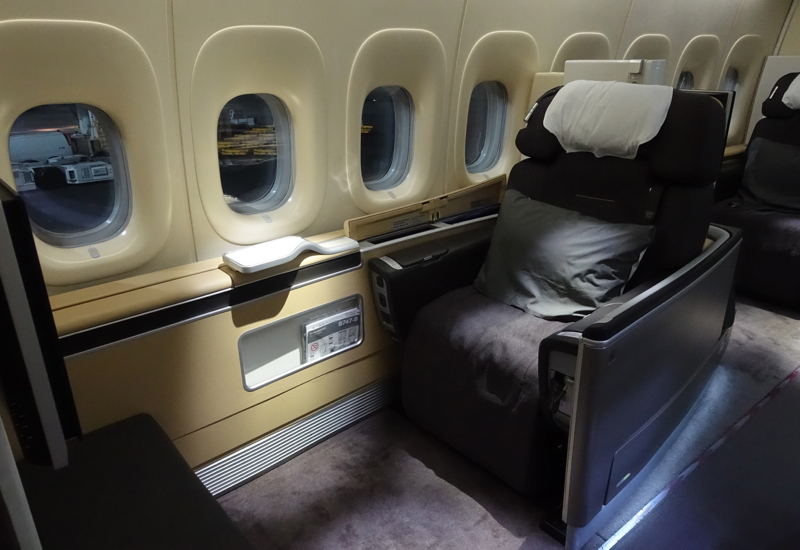 I definitely enjoyed this Lufthansa First Class flight more than my previous Lufthansa First Class flight on the A330-300, for a few reasons. 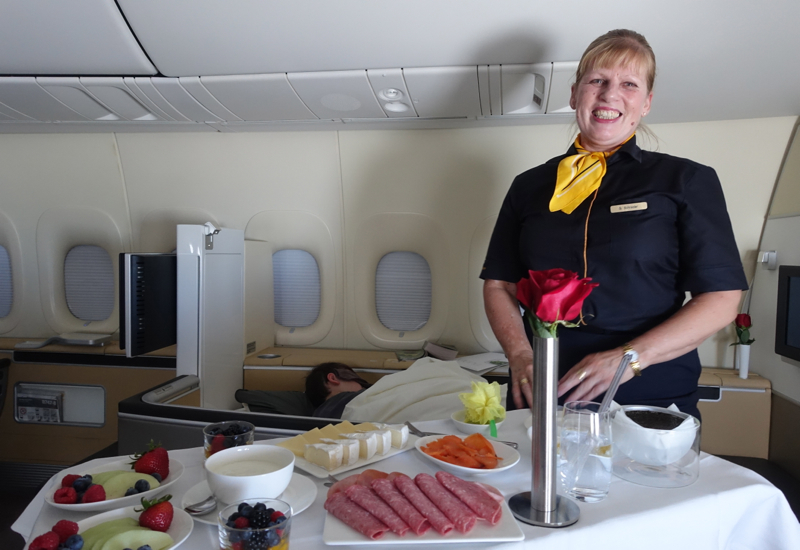 We were the only passengers in the entire cabin, which made for an incredibly private experience and also great service from the very friendly crew; there was none of the awkwardness my husband had experienced a few years back on his Lufthansa flight that consisted of some German businessmen regulars and him. Even apart from us being the only First Class passengers, we enjoyed being in seats 1A and 1K, the furthest forward seats in First Class, and I highly recommend selecting these seats on this aircraft. These are seats and of course not enclosed suites. 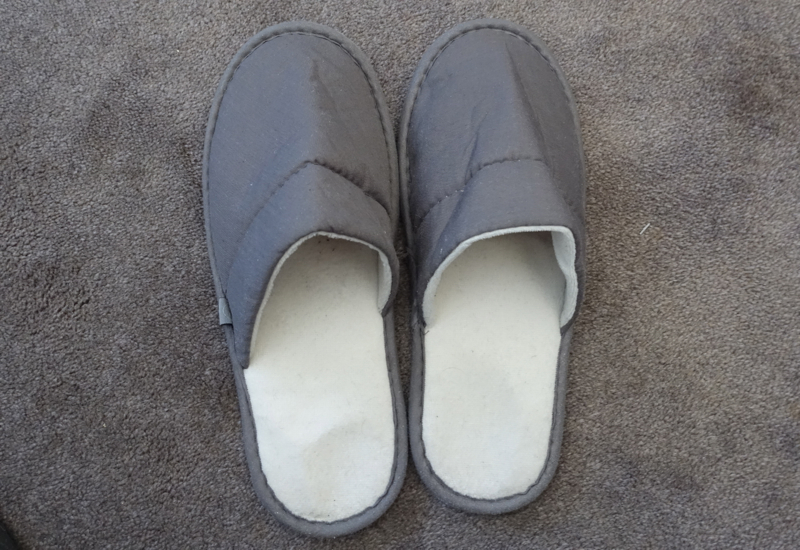 Honestly, however, I'm most focused on bed comfort and I found these seats in bed position some of the most comfortable of those that do not have a memory foam mattress pad the way Singapore Suites and JAL First Class and JAL Business Class do. While I didn't try the dinner, on such a short flight between the East Coast and Europe, I highly recommend that anyone who values sleep have enough dinner in the lounge to tide them over until breakfast, since I'm convinced that eating lightly also helped me sleep better. 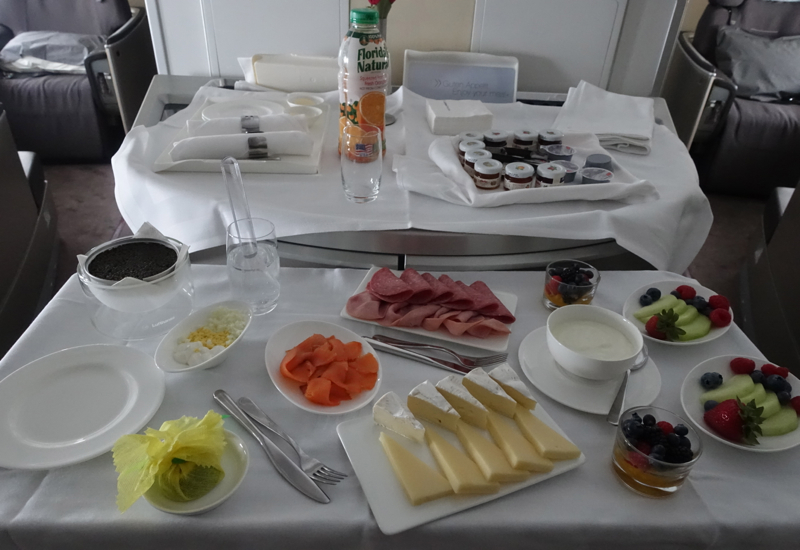 There's no reason you have to miss out on caviar and champagne, either, since the crew was perfectly happy to serve it to me as part of breakfast. 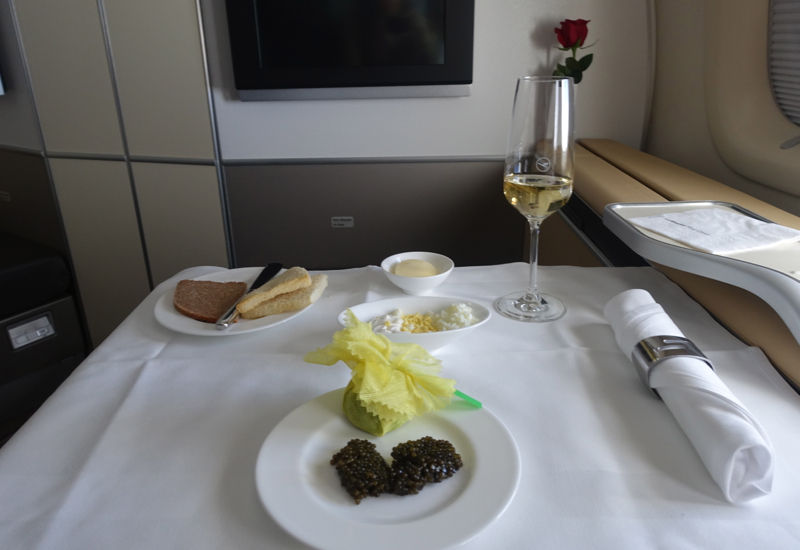 If you've recently flown Lufthansa First Class on the 747-8, what was your experience? 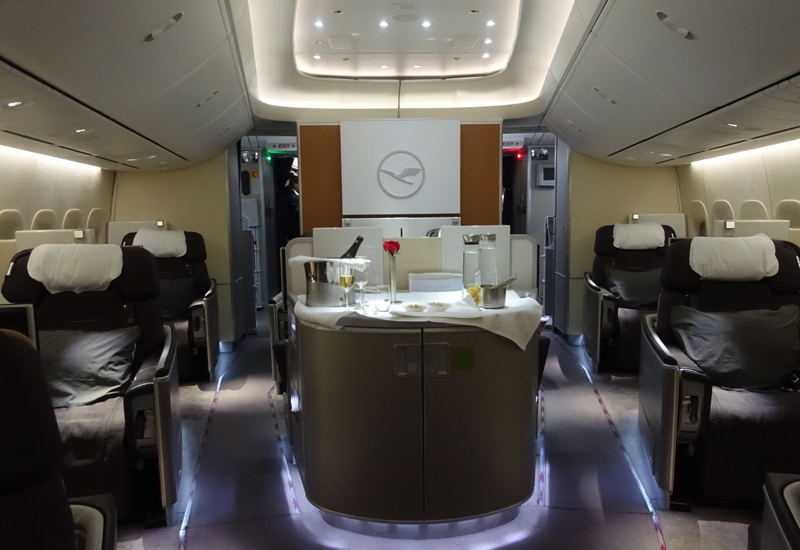 1 Comment on "Review: Lufthansa First Class 747-8 NYC to Frankfurt"